A RYANAIR passenger, whose ‘drunken antics’ forced a flight from Manchester to divert back to the UK and delayed the journey for all the other passengers for a day has been fined just £2,500 in court. When the flight carrying father-of-five Karl Wend, 45, arrived back in the UK he was arrested and his fellow passengers were forced to wait until the following morning for another flight. Wend, from Runcorn in Cheshire, was heading to Tenerife on a stag do with friends when he was aggressive towards another passenger accusing a young woman of stealing his phone and travel documents. The flight had already taken off two-hours late during which time Wend and his pals drank at the airport bar. Shorty after takeoff Wend became abusive and Manchester Magistrates’ Court heard that the Ryanair pilot decided to abandon the four-hour flight to the Canary Islands and return to Manchester Airport. Prosecutor Tess Kenyon said, “There was a two-hour delay to the flight and Mr Wend was with a group who were out for a stag do on that flight. “A supervisor of the cabin was working on that flight when he was approached by a passenger who stated that a man was being hostile and becoming aggressive towards a young woman and accusing her of taking his phone. “He went over to speak to the male, which happened to be the defendant. Mr Wend told the supervisor that this woman had taken his mobile phone and she wasn’t speaking to him. The supervisor noticed this man was drunk, he smelt of alcohol, stumbled around and he believed he was on a different planet. “The defendant then became aggressive with the supervisor and began shouting, so he called over other members of the cabin crew. “This man then became threatening and abusive and the woman involved explained to the staff that she was intimidated and scared. “The crew attempted to separate the defendant from the young woman but he tried to push past and tried to talk to the woman who he believed took his phone. He then began making accusations that she had stolen his travel documents. “Mr Wend continued to try and make his way towards this young woman and the supervisor ended up placing himself in between them. She was visibly upset. The supervisor came to the conclusion that it wasn’t safe to continue with the flight due to the behaviour of the defendant and told him this and asked a member of the crew to instruct the captain. Since the incident Wend has issued an apology. “I just got carried away. I never normally drink, but that day I drank a lot. “I accept what I did was wrong and I wholeheartedly apologise, if I could apologise to every single person on that plane, I would. My last memory was leaving the bar. “I am a hardworking man, and I do show remorse for this. This is so out of character for me, I would never ever do this again. “People know me as ‘Karl the Smiler’ but I haven’t smiled since then. I understand how angry the passengers must have been, I know I ruined their flight and their holiday, I accept they would have had to rearrange the flights and I am truly sorry for that. 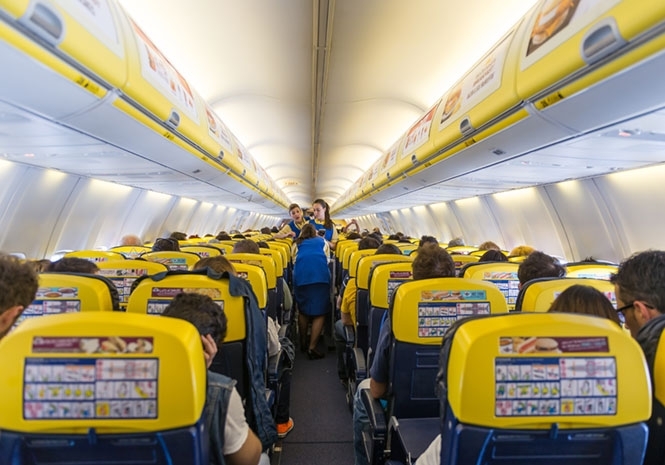 A Ryanair spokesman said, “This flight from Manchester to Tenerife (8 Mar) returned to Manchester after a passenger became disruptive inflight. The aircraft landed normally and the passenger was met by police upon arrival. “Customers were provided with overnight accommodation in Manchester and boarded a rescheduled flight for Tenerife early the following morning. Wend was fined £2,500 by the court.